Warwick Valley High School senior Megan Reilly has done it again. This time, she’s a National Champion! 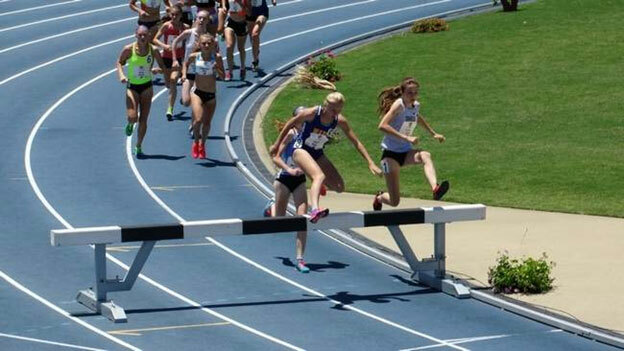 Last week, Megan Reilly won the New York state Federation title in the steeplechase, and this week she brings home the steeplechase championship from the Outdoor Nationals, where she finished the 2,000-meter competition in Greensboro, N.C. in 6 minutes and 46.01 seconds. The national win is the icing on the cake for Megan, who won the state cross country championship in her freshman and sophomore years. Her time of 4:25:78 in the 1,500 meters ranks third in Section 9 history, and she ranks no. 4 in the 3,000 meters and is now the top steeplechaser in Section 9 history. Girls Distance Medley Relay – Greer Liguori, Megan Reilly, Jessica Savarese, Jennie Prial – Third place with a time of 11:46.99. In addition to the impressive steeplechase win, Megan was part of the Lady Wildcat foursome that took third in the Girls Distance Medley Relay in North Carolina – Megan, Greer Liguori, Jessica Savarese and Jennie Prial ran the medley with a superb time of 11:46.99. Megan’s older brother, Thomas Reilly, was also a scholar athlete at Warwick Valley who went on to compete and further his education at Ivy League school Dartmouth University in New Hampshire. Megan’s younger sister Genevieve is in 8th grade, and currently a standout student athlete on the X-C, Indoor and Outdoor Track & Field teams. Megan Reilly will attend Loyola Marymount University in the fall on a full athletic scholarship and compete in the West Coast Conference under Head Coach Scott Guerrero. Megan is the daughter of proud parents Thomas and Susan Reilly.